Matt Wesolowski’s Six Stories was one of my books of 2017. In Hydra we met Scott King with another of his Six Stories podcasts, this time much darker and much, much spookier. If Nana Wrack gave you nightmares the first time round, the black-eyed children in Hydra might just keep you awake all night. 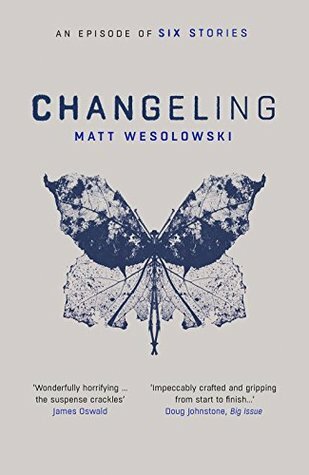 Changeling is another beast, and easily Matt Wesolowski’s best yet. And that, my friends, is a pretty damn high bar. Scott King is back with another of his ‘Six Stories’ podcasts. Six people, six sides to a tale, six viewpoints on the events surrounding the mysterious disappearance of little Alfie Marsden, thirty years ago. I dipped my finger into the Alfie Marsden case and something reached up and took hold. I *raced* through Changeling. Having read and loved Matt’s first two books, I thought I knew what I was letting myself in for, thought I had a feel for the pattern of the story. After reading the first episode of six, thought I knew where it was going. Oh how very wrong I was. The thing I love about his writing is the way that he puts you in the head of these distinct characters. You’re hearing their voices, hearing their side of the story. But just as two people can see the same thing and tell you different versions of what happened, so imagine what six people can do. The plotting is ingenious, and the way those six stories mesh together is played to perfection. Changeling deals with some pretty dark subjects – a missing child is never an easy read, but it’s so much more, and so much more that I can’t say without giving away too much. Trust me in this, it’s massively relevant, incredibly intense and just so, so good. And can we talk for a minute about Wentshire Forest. I am *so* glad that I’m not going camping in the woods any time soon. Scarclaw Fell in the first book was pretty spooky, but that’s got *nothing* on Wentshire Forest. Is that a tapping at the window I can hear…? You can find Matt Wesolowski on Twitter @concretekraken. Mark Swan (@Kidethic) delivers yet another stunning cover. One day I’m going to have to do a post on my favourite of his covers – Changeling will definitely be on the list.